A lightning protection system for your boat is not only recommended by most authorities but is also a required by many insurance companies. According to some reports, there are, in the US an annual average of about 100 deaths, per year due to lightning strikes, of those approximately 13 occur on board boats. Quite what this means depends on how you wish to interpret the ‘statistics’. For many of us the odds of being struck seem so slight that lightning protection hardly seems to be an issue. And from the research I have done it would seem that you cannot make a boat lightning proof. However, if there is a way to reduce the odds of a strike damaging us, our crew or the boat then it’s got to be worth trying. First we should be aware that there is still much scientific speculation about the mechanisms of lightning and lightning strikes. What we do know is that lightning is a massive electrostatic discharge. When a boat gets struck the lightning is trying to find the most direct and the easiest path to ground (in this case the water). And it is going to be attracted by the nearest (tallest) route that is a better conductor than the air. In the case of a sailboat this will be the VHF antenna’ the mast and the rigging wires. Powerboats are typically struck on the VHF antenna or Bimini top. Unfortunately the lightening is rather fickle. Having latched on to a mast it is very easily attracted to anything attractive and nearby on its way down. This produces what are called “side flashes”. It can be attracted by anything metal, such as chain-plates, battery cables, engines or water tanks. And it will happily pass through human beings, we are unfortunately also good conductors of electricity. A lightning strike also generates a momentary but extremely powerful electro-magnetic field. This can ‘induce’ currents in adjacent wiring without actually passing through them. It can fry every piece of electronics aboard and even affect a magnetic compass. Regardless of what, if any, lightning protection system you have on your boat, there are some sensible predations to take if you see an electrical storm approaching. The majority of lightning injuries and deaths on boats occur on small open boats without a cabin. So if you sail in an area where lightening is an issue check the forecasts, if thunderstorms are forecast, do not go out. If you are out on the water when the sky turns threatening, get back to land as quickly as possible. If you are on a boat with a cabin, drop anchor and stay below. If you can, disconnect all your electronic equipment and put it in something such as the oven, hopefully it will act as a Faraday cage. Having disconnected it, stay well away from any of the connectors especially the VHF antenna. Don’t try to use the radio unless there is a real emergency. Try not to touch any metal hardware, mast, rigging, ships wheel etc. Then pour yourself a large glass of your favourite tipple, sit tight, watch the light show and keep your fingers crossed. If anyone onboard should, unfortunately, be struck by or affected by lightning get proper medical help as soon as possible even if it requires using the radio. A person struck by lightning may appear dead, with no pulse or breath however, they can often revived with CPR (Cardiopulmonary Resuscitation). Always try to treat anyone who is unconscious first, Treat those with other injuries such as burns next. There is no danger to anyone helping a someone who has been struck by lightning, they will not have retained any electric charge. Let’s be clear, there is no way to prevent a strike. The best we can do is to protect our boat, her gear and crew by channelling the lightening safely to ground via a lightning protection system. To do that we need to provide the lightening with its own, easy, fast, way through, one that keeps it away from us and our expensive gear. And to make sure that it takes that route, we need to tempt it with a “Lightning Rod”. The top the rod should be a minimum of six inches above any other routes the lightening might latch on to. And the lightning protection route itself should be as robust as it can be made and be as direct as possible. Direct to a grounding plate or "exit terminal". There are “experts” who insist that the masthead end of the lightening protection system should be sharpened to a point. While other “experts” insist that it will be more effective if it is ‘domed’ or rounded. And yet others promote the use of an ‘air terminal’ that looks like a bristly brush sometimes called a lightning "dissipater". My guess is that there is probably little difference between them however, the bristly one is less likely to become a perch for defecating seabirds. The general recommendation is that the top of the air terminal should be higher than anything else nearby, by about 200mm or so. The theory is that there will be a cone shaped area below the apex of the air terminal that is relatively safe. This lightening protection area extends at about 45° from the vertical. The boat and all her rigging should be entirely within this cone. If any parts of the boat extend outside of this there should additional air terminals. A boat with more than one mast should have an air terminal on each. The idea, as I understand it, is not so much that anything within the cone is “protected”, but that any lightening heading in that direction will be attracted to the air terminal instead. And having struck the air terminal it will then be conducted safely to ground via the rest of the lightening protection system. To bring a direct lightning strike down through the boat from the air terminal requires a robust conductor or conductors leading vertically in a straight path to ground. Copper is the preferred metal, with a wire gauge of No. 6 or even better, #4 AWG stranded copper. An aluminium mast can be the conductor provided that there is a direct connection to the air terminal and a substantial wire connection to the grounding plate at the bottom. A wooden mast cannot be considered as a conductor however, metal shrouds and stays could be used as the down conductors providing that there is a continuous connection down to the chainplates and these are attached to the grounding electrode. However, stainless steel is not an especially good conductor. And on a traditionally rigged vessel the shrouds are likely to have ‘parcelling’, ‘serving’, deadeyes and lanyards which effectively act as insulators. Alternatively a metal sail track could be considered as the conductor but again it would need be electrically connected to the air terminal and to the grounding plate. Generally with a wooden mast there should be a separate conductor, possibly a #4 AWG or larger tinned, copper, wire running down the mast. All conductors and connections should be kept as straight as possible. So we now have an air terminal or terminals connected to the grounding wire, this now should then be connected to a ground plate or terminal to complete the lightning protection circuit. The grounding plate is considered to be the "exit terminal" of the lightning protection system. The grounding plate or grounding strip is installed externally on the hull so that it is immersed in the water. And it should be connected directly to the down conductor with as little bend or deflection as possible. This "exit terminal" should according to the ‘experts’ be of copper, copper alloy, stainless steel, or aluminium with an area of at least 300 square mm. Ideally it should be a strip with sharp corners or points rather than a smooth or round edged plate and it should never be antifouled, painted, caulked or faired into the hull. And the grounding ‘strip’ should run from directly below the lightning protection conductor or mast, toward the aft end of the boat. All of which would seem to rule out the suggestion that the exit terminal could be an external ballast keel connected via a keel bolt. It has also been suggested that the grounding plate should be augmented by the use of perimeter "grounding terminals", long strips at the water line. This is the contention of another ‘expert’ who believes that lightning prefers to go to the surface of the water rather than down into it via the ground plate. On wooden boats it is also recommended that an equalization “bus bar” be installed as part of the lightning protection, on the inside of the hull parallel to the exterior grounding strip and electrically connected to it at each end. So if having all that spiky metal on the outside of the hull isn’t enough you’re gona need even more inside. This “bus” is there to connect to the boat's engine and any other large metal objects above and below decks and those perimeter “grounding terminals” to the Lightning Protection system to protect against side flashes. So what are these side flashes that require all this bonding and auxiliary grounding electrodes in the lightning protection system? and external side flashes that arc directly between an on-board conductor and the water. They are more likely to occur when the path to ‘ground’ is insufficient to carry the charge. This can create a chain of side flashes from one metal item to the next as the lightening tries to find its way to ground. It would also seem (according to one set of statistics) that side-flashes are more likely to occur on a boat in fresh water that one in salt water regardless of the lightning protection fitted. To minimize side flashes, all large metal objects such as tanks, engines and even such things as winches, seacocks and stoves should be connected to the lightening protection system by copper connections of least #6 AWG. The larger items such as the engine block are better being connected directly to the grounding plate or the lightening protection system’s equalization bus. None of these connections should be routed alongside the boat's wiring as this can lead to high voltages being inducted into the boat's wiring. However, the negative terminal of the DC electrical system should be bonded to the lightning protection bus. Michael Faraday (1836) invented the Faraday cage or Faraday shield when he discovered that lightning tends to prefer to run along the outside surface of conducting objects. The ‘cage’ blocks external static and non-static electric fields thus protecting anything inside that is insulated from the outside of the ‘cage’. Onboard electronics are particularly vulnerable to damage from lightening even when there hasn’t been a direct strike. Wherever possible, it would be a good idea to enclose instruments in metal cabinets that are connected to the lightning protection system. And surge suppression devices installed on all of the wiring. 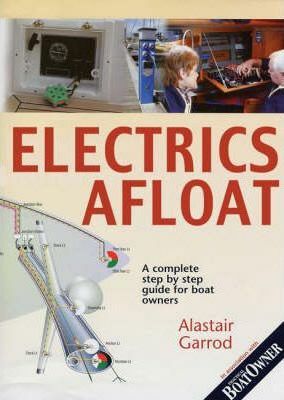 An alternative lightning protection, when lightening is imminent is to place all electronics in the boats oven, preferably insulated from the sides.